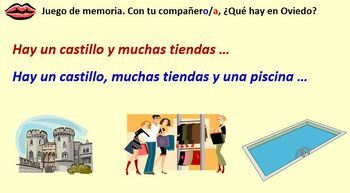 Whole lesson power point presentation & Handout on Describing your town or village; Using ‘a’, ‘some’ and ‘many’ in Spanish. Introducing key lesson questions ¿Qué hay en tu barrio / tu pueblo / tu ciudad? and ¿Qué hay en Oviedo? Writing task - Students write a description of their town or city using a range of connectives. They include where they live, what there is and there isn’t and an opinion with justification. Suitable for elementary and middle school. The lesson is planned in detail to ensure pace and interaction as well as maximise learning. The answers come up as you click. Based on the Viva 1 Course.